The possibilities will vary a little bit depending on your niche and your target audience, but with some creativity there are plenty of possibilities. For an example of creativity, take a look at the products recently offered by Stuart Walker at Niche Hacks. You can buy Stuart’s list of 150 popular Amazon products priced over $1,000 (perfect for affiliate marketers and niche site builders). Stuart also sells tips to increase email open rates and email click rates. One of the biggest reasons that most bloggers and website owners avoid creating and selling their own digital products is a fear of not being able to sell the product once it is completed. Maybe you don’t have a large existing audience or you are unsure of how to go about promoting it. In this article we’ll take a look at 15 different ways to increase sales and make more money with your own digital product. Many of these tips come from my own experience over the past 4 years selling digital products in a few different industries. Not all of them will be a good fit for every situation, but by implementing the ones that are a good fit you can see a serious improvement in the success of your products. In order to make sales you will need to earn the trust of your potential customers. One of the best ways to do this is to showcase real testimonials from your customers, or endorsements from recognized authority figures in your niche. Testimonials often have a greater impact when a photo of the person providing the testimonial is included, because it just tends to give a more personal touch. Be sure keep records of all emails and correspondence you receive from customers that could be used as a testimonial. If you get a positive message from a customer, ask that person for their permission to use the quote on your website or in your marketing efforts. You can also solicit testimonials from customers by asking for feedback after a sale. Some customers may be very happy with your product and willing to provide a testimonial, but they may not take the initiative to reach out to you unless you ask for feedback. Endorsements from others in your industry can also be extremely effective. It could be an endorsement or recommendation for the specific product that you are selling, or it could be a general endorsement of you, your knowledge, your experience, or your character. 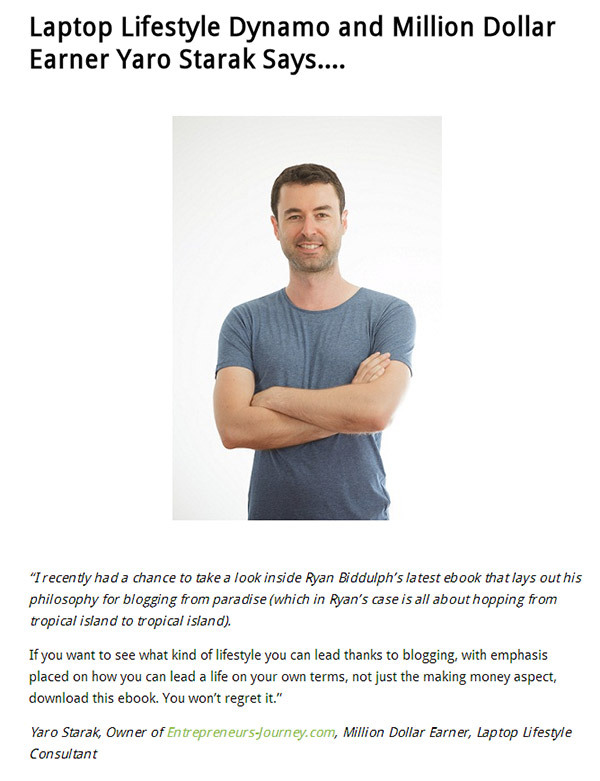 An excellent example of this comes from Ryan Biddulph and the e-book that he launched recently, Blogging from Paradise. Ryan was able to get endorsements from well-recognized authorities like Chris Brogan and Yaro Starak. He was able to get these endorsements because he puts a lot of effort into networking and building relationships, which is a good example for anyone selling their own products. Although digital products are not tangible, their appearance and presentation can have a huge impact on sales. If you’re selling an e-book, make sure you have a cover design that gives it a professional look, just like you would do if you were selling a physical book. With other types of products you’ll want to have well-designed graphics to make a strong impression with potential customers. Getting this type of design work done doesn’t have to be expensive. You can get a nice e-book cover designed at a site like Elance or Odesk for very reasonable prices. I’ve paid about $50 in the past to have e-book covers designed at Elance. 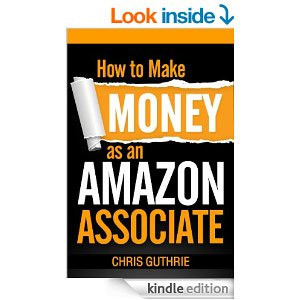 Chris Guthrie of Entrepreneur Boost uses nice cover designs for his e-books, like the one you see below. The effectiveness of a sales or product page will have a big impact on the success of your product. With some products you may use a typical sales letter or sales page, but with other products you may use a page more similar to product description page on an e-commerce website. Regardless of what type of page you use, the copy of the page and the visuals used are critical. When it comes to writing sales copy you can hire a professional to do it for you, or you can do it yourself. If you’re not an experienced copywriter you can find some example sales pages and structure your page to replicate it. You obviously will want to use your own text, but pay attention to the types of headlines, colors, formatting, and spacing used on other sales pages. Pay attention to how they display testimonials or endorsements, how they list benefits of the product, and how they implement the call to action. Creating an effective sales page is usually a on-going process that will involve frequent tweaking and testing. Even small improvements to the page can have a very real impact on conversions and you’re revenue from the product. A good example of a sales page that could serve as some inspiration for your own products is the one from Point Blank SEO Link Building Course. The page uses nice graphics, effectively showcases testimonials and endorsements, succinctly describes the course and its benefit to customers, and calls the visitor to action. Many people who consider creating and selling their own product are hesitant because they don’t think they have a large enough audience for marketing their product. While having some established name recognition and lots of traffic to your own website or blog certainly won’t hurt your chances of success with your product, it is still possible to make plenty of money with your own product even if you have no existing audience at all. How? By getting other people to promote it for you. With an affiliate program you can get other bloggers, website owners, and email marketers to promote your product for you in exchange for a commission on any sales that they refer. Digital products are especially lucrative for affiliates because commissions can be quite high without the costs and overhead associated with physical products. Most affiliate programs for digital products pay anywhere from 25 – 75% to affiliates. The higher commission gives affiliates more incentive, and can result in higher sales and profits. Setting up an affiliate program may seem like a daunting task that would require a lot of technical knowledge, but it can actually be quite simple. Software like iDevAffiliate can be integrated with just about any shopping cart, and some e-commerce platforms come with their own affiliate tracking already included. An affiliate program is possibly the best way to exponentially increase your sales, but simply setting up the affiliate program is not enough. In most cases you will need to be proactive and go out and recruit some affiliates to promote your product. You could contact other bloggers in your niche, people who have large mailing lists, people who have promoted or reviewed competing products, or ask your customers to promote the products. It’s a good idea to add a page to your site with all of the relevant details of your affiliate program (like the commission percentage, cookie length, pay out terms, and any restrictions) to help you attract new affiliates. Not only do you want to recruit affiliates, but make it as easy as possible for them. You can do this by having things like pre-written emails that they can send to their list to promote your product and banner ads to be used on their site. If you’re not a designer you’ll probably want to use a service like RightBanners to get professional banner design at a reasonable price. Blog reviews can be a great way to boost sales of your digital product. If you have a strong network of other bloggers in your niche you may be able to get some of them to review your product for you. Other options include paying for reviews (use this with option, I recommend asking for “nofollow” links to avoid link buying penalties from Google), or getting reviews from affiliates. Once you have your affiliate program set up you can reach out to bloggers who reach your target audience and ask them if they would be interested in reviewing your product and using affiliate links in the review. These types of reviews can be very lucrative for affiliates, so if you have a quality product and you are approaching the right bloggers you should be able to get some reviews. Don’t expect that every blogger you contact will be interested, so you’ll need to reach out to many different bloggers in order to get a decent response. 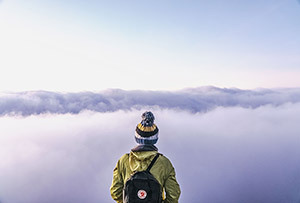 To give bloggers/affiliates more incentive you can give them a free copy of your product to review, offer a higher commission than advertised, provide them with graphics that can be used with the review, and even give them the main features and benefits that they can cover in the review (if they want) to get the best conversion. Optionally, you could also set up a custom coupon code to give their readers a discount on the product. Obviously, this will reduce the revenue and profit that you get from each sale, but I’ve seen it to increase overall revenue and profit by giving more incentive to potential customers. If you’re not sure which bloggers to approach about reviewing your product, one of the best ways to start is by searching for reviews of your competitors or similar products. If you find blogs that have reviewed other similar products, chances are they may also be interested in reviewing your product. Another way to give potential buyers more incentive to make a purchase is to increase the value of your offer. You can do this in a number of different ways, including making changes or adding on to your product to make it worth more to customers, adding on some additional product or bonus, or adding some sort of service (like a free 30-minute consultation). A great example of this comes from Theme Trust, a WordPress theme shop. 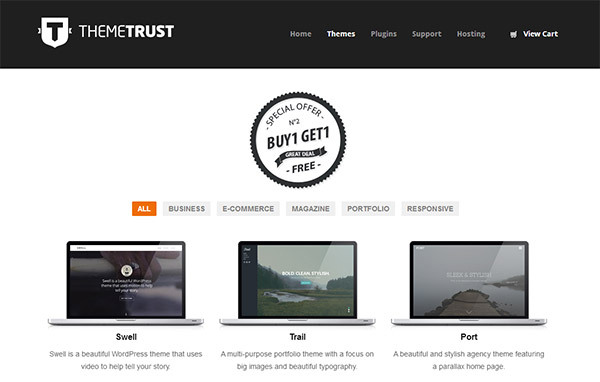 With every purchase at Theme Trust you can get two themes for the price of one. Rather than reducing the price of each theme by 50%, Theme Trust is still able to collect the full price for each theme purchase, but the buyer is able to get a second theme for no added cost. A sales funnel is huge topic on its own that I can’t cover in great detail here, but it’s worth exploring on your own (see The Sales Funnel Explained by Yaro Starak). A sales funnel will lead customers through a series, involving a purchase or an offer. For your sales funnel you may use a freebie to entice people to subscribe to your email list, and then once they have joined the list they will receive messages and offers to purchase your product. You may start with a low-priced product and then proceed to offer higher-priced products to customers who have purchased your lower-priced products. An effective sales funnel can turn interested browsers into paying customers, and once it is set up it can run with very little involvement on your part. As a product seller the first step is to set up an email list, if you don’t already have one. You can use a provider like GetResponse (the first month is free) or AWeber. Create a free resource that will entice visitors to subscribe to your list, and then your list can be a powerful asset to increase the sales of your product. An autoresponder is a critical part of the sales funnel, and even if you don’t have an advanced sales funnel set up you can make good use of a simple autoresponder. After visitors have subscribed to your list to get your free resource they should be receiving emails from you that have been set up to go out automatically at certain intervals. The autoresponder is simple to set up with an email marketing provider like GetResponse or AWeber, but autoresponders are often underutilized or not used effectively. Many bloggers and marketers have a welcome email set up through the autoresponder to go out immediately after someone subscribes, but many people stop there. If you sell a digital product you can use the autoresponder to promote your product and increase sales. The promotion doesn’t always have to be a hard sell. For example, you can use the autoresponder sequence to build credibility and establish trust by providing helpful information. Then after several non-sales related emails have been sent you could send an email to pitch your product or make an offer to subscribers. The trust and credibility that you have developed through the autoresponder can help to lead to more sales. In a previous point I talked about the opportunity and the need to recruit affiliates. One of the ways that you can make it easy for affiliates is to use a platform that they are already familiar with. For example, if you sell your digital product using a platform like Clickbank, JVZoo, or E-Junkie it will be very easy for affiliates who already use those popular platforms to promote your products. Using a popular platform like Clickbank can expose you to a huge number of potential affiliates, but you may still want to be proactive and reach out to affiliates yourself. You can find popular products in your niche that are being sold using the same platform, find affiliates who are promoting those products, and reach out to them about the possibility of promoting your product. Let’s take a look at an example. Say you have an e-book or course on dieting and you are selling it with Clickbank. 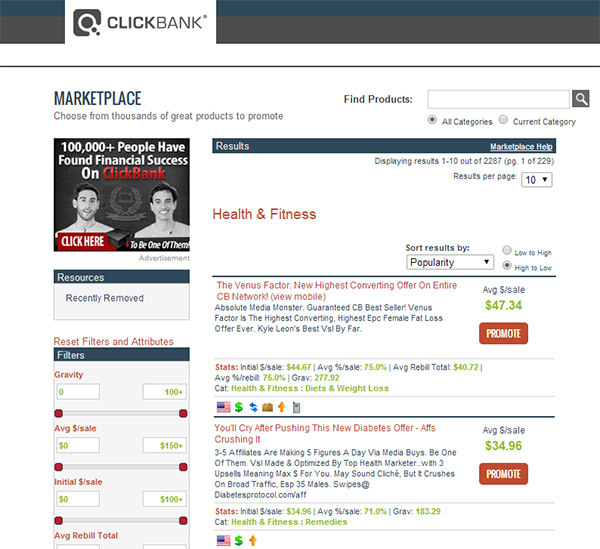 You can easily find other products targeting the same audience by going to the Clickbank Marketplace and clicking on the “Health & fitness” category. This will give you a list of products in the category sorted by popularity. The first product listed is titled “The Venus Factor”. If you do a Google search for “The Venus Factor Review” you will come across plenty of blogs and sites that have published reviews of this product, and almost all of them are affiliates. These would be ideal people to contact about your own product. You could give them a free copy of your e-book and ask them to consider reviewing it and promoting it as an affiliate. Since they already have a Clickbank account it will be easy for them, and they’ll be more likely to become your affiliate than they would if they had to sign up for another affiliate program. Repeat this process for a few other popular products in the category and you should be able to find plenty of potential affiliates for product reviews. If you are looking for some assistance with finding affiliates to promote your product, one option is to hire a JV broker to help. The JV broker will have existing contacts and, hopefully, influence that will be used to find ideal affiliates to promote your product. The JV broker will also receive a commission from each sale that their affiliates make, plus some will require an upfront fee. So you’ll be making less from each sale, but the potential to make a lot more sales may be worth it. Personally, I don’t have experience working with a JV broker so I cannot recommend anyone specifically, but if you do a Google search you will find plenty of options. This may sound obvious, but most bloggers who are selling their own products do not do it very effectively. There are all kinds of possibilities for promoting your product within your blog posts. Some options are more aggressive, and others are more subtle or passive. Of course, when you launch a product you can and should write about it in a blog post, but many people stop there. Taking it further, you can mention and link back to your product whenever it is relevant in your posts. 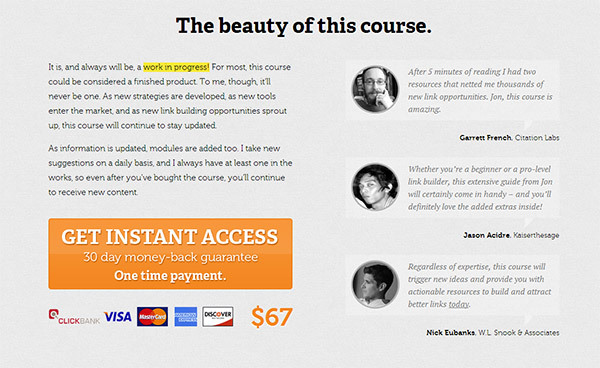 With some types of products you can publish tutorials or guides that show how to use the product or put it into action. You can also publish case studies about customers and how they are using the product in the real world. Whenever you make updates or changes to the product you can also write about what is new. If you use some creativity there are all kinds of ways that you can work your product into your blog posts, and this added exposure can lead to more sales immediately, as well as more sales down the road as readers continue to come across those blog posts. Let’s take a look at an example. Design Panoply sells digital files for graphic designers. Their products can be purchased individually or with an all-inclusive membership. The Design Panoply blog sometimes includes tutorials that promote their products in one way or another. This tutorial shows how to create a vintage photo effect in Photoshop. 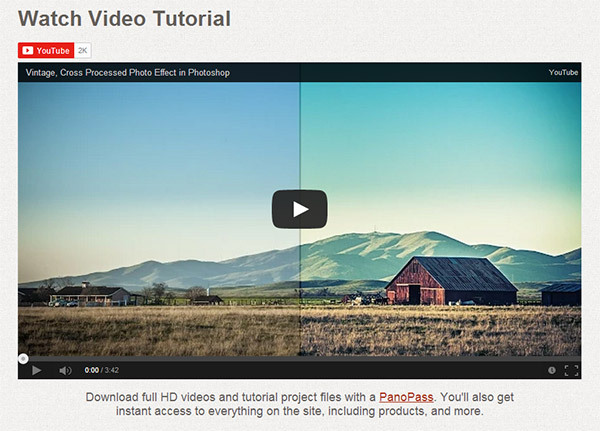 Members can download an HD version of the video as well as the Photoshop file that is used in the tutorial. Writing guest posts for other blogs is a great way to increase exposure, and many bloggers do this for building traffic to their own blog. If you are selling a digital product guest blogging can also be effective for getting more exposure and getting traffic to your sales or product details page. Your guest post will (almost always) include a brief author bio with link back to your site. Rather than simply linking to your home page, link to your main product and also mention it in the bio. If you write for blogs that have an ideal target audience that matches up well with your product, and if you write about topics that are related to your product, you can have pretty good results with guest blogging. If it is allowed by the host blog you can include a link to your product within the body of the article when it is relevant and natural, but in some cases you will need to stick to just using the author bio to promote your product. People respond to discounts and limited-time offers. You’ll need to decide if discounting is an approach that you want to take (the downside can be a de-valuing of your product if you do it too much), and if so, how you plan to go about it. You could promote a limited-time offer on your site or blog and use a header notification bar like Hello Bar or Foobar to give it plenty of exposure. You could send an email to your mailing list with an exclusive offer that is not publicly promoted on your site. You could work with your leading affiliates and give them coupon codes to promote on their sites or send to their lists. There are a lot of different ways you can go about using a promo, and in many cases it will be an effective way to temporarily boost sales and revenue. In recent years there have been countless sites launched to take advantage of the daily deal craze started by sites like Groupon. Digital products provide great opportunities for these types of promotions because you can offer them at a deep discount and still make money. With a physical product you can only discount it so much before you start to lose money due to the cost to product the product, but with a digital product once it is produced you can sell as many copies as you’d like. When it comes to selling at daily deal sites, niche-specific sites often provide the best opportunities. Daily deal sites exist in just about any niche or industry that you can think of, you just may need to do some searching to find them. For example, tech-related deal sites like MightyDeals, AppSumo, and StackSocial all have huge audiences even though they only focus on products for a specific audience. When selling at a deal site you will be sharing a commission with the deal site, and that commission will vary depending on the site. The larger sites that have the power to drive more sales tend to keep a higher percentage of the sale. In general, the split is often around 50-50 between the deal site and you, the seller of the product. Offering a deep discount and only keeping 50% of the sale obviously means you’ll be making less per sale, but the volume of sales can make up for it. I’ve been using deal sites for several years and overall I’ve had good results. A similar concept to the previous point is to sell your digital products at a marketplace site. The different between a deal site and a marketplace site is that your promo at a deal site will be for a very limited amount of time, maybe a day or a few days. With a marketplace site you can set up your shop and sell indefinitely. If the marketplace has an established audience it can be a great way to increase your sales. The marketplace will either keep a commission from each sale or charge you a fee to list your product. Etsy is probably the most popular marketplace site, and although it is known for hand crafted and vintage products, it can also be used to sell digital products. If your digital product is a good fit for Etsy’s audience it can provide a great opportunity. Marketplace sites exist in many niches, and new ones are popping up all of the time. Of course, the popularity of the marketplace will impact the potential for selling your own product. Some good examples of popular marketplaces include the Envato network like ThemeForest, CodeCanyon, and GraphicRiver, where you can sell things like website templates, WordPress themes, WordPress plugins, and stock graphics. Creative Market is also a very popular marketplace that reaches a similar audience and has more favorable terms for sellers. If you sell digital products please feel free to share in the comments and let us know how you go about promoting your products and increasing sales.